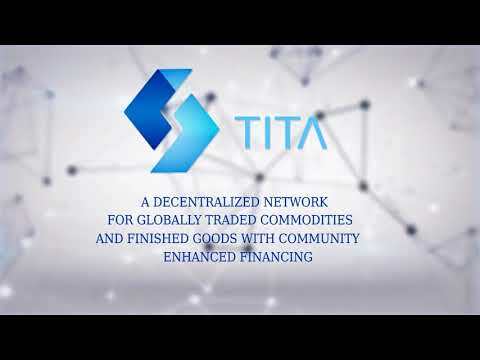 The Tita Project is all about building a decentralized ecosystem powered by Blockchain technology for the buying and selling of locally/globally traded commodities and finished goods thereby setting up pedestals that enhance the financial systems of the communities where these commodities are produced. Tita project is a unique and the very first of its kind in Africa, creating a peer-to-peer decentralized market place and also a decentralized crypto-to-commodities asset exchange. Powered by the Blockchain technology, Tita Project provides transparency, security and ease of financial settlement of any trade transaction on the network across national and international borders. The TITA Network is powered by the Ethereum Blockchain through the use of Smart contracts. The TITA Project is creating a decentralized network, its ecosystems are driving to Increase the Efficiency of the Supply Chain of finished or unfinished goods, Bridges Asset Investments, diversifies risk in the commodity Market and provides enhanced financing for producing communities. The TITA Project has a strong value proposition to Commodity Exchanges, Finished goods Market, Manufacturing Organizations, logistic companies, security companies providing services for commodity trade, clearing houses, agents, buyers and sellers alike. Thereby creating a unique space for our users by creating multifunctional platforms that connects these various players, making trade easier and give them the ability to access a wide range of services. With the Commodity Market capitalization valued at over $50 Trillion, the TITA Network empowers everyone to seamlessly interact, trade and invest in one of the biggest markets in the world. Concept, Analysis and design of the project. Preparation for Token Sale / Private Sale of TITA tokens. ICO ends / Exchange Listing / TITA CENTER Platform development and beta testing begins. TITA center African Market Launch. TITA CENTER Product update implementation / Expansion in African Market / Partners Round table meeting and Seminar. TITA EXCHANGE Development and Beta Testing. TITA CENTER Asian and Middle East Market Launch / TITA EXCHANGE LAUNCH For Africa. TITA Network Product Update implementation / Partners Conference and Round Table Seminar. Implementation of government and Producing community’s synergy programs / Expansion in Newly Launched Markets.